Gems is an innovative new platform for performing microtasks. The potential market for which is huge. The Chinese government alone uses two million workers for its microtasks. It is a market that is growing and companies such as Amazon have their own platform (Mechanical Turk) to complete this work. But for many workers, Mechanical Turk is no good, they only pay actual cash in a few countries. For many workers outside of these locations, Mechanical Turk is not worth their time. The Gems platform allows tasks to be verified and prevent malicious actors on the system by linking work and transactions back to their specific Ethereum wallets. Workers can also stake tokens on the system and be rewarded for better work and being more honest. The whole system is designed with security in mind for everyone and helps to foster honest relationships within its design. Gems Trust Score is designed to enhance the performance of workers and give them an incentive to produce better work. The trust score is linked to their wallet addresses and it means that workers are incentivized to give a good performance. Workers will rely on the trading history that is linked to their wallet addresses so that those creating the tasks can see who the best people are for the job. Platform and payment mechanisms are built into the platform and help to save on the processing fees for all sides. This is one of the major problems of other such platforms and allowing everyone to use one currency removes many problems. The beauty of Ethereum is that everyone has one unifying payment platform to work from that is already proven secure and efficient at providing results to users. As you can see, the GEMS platform offers an innovative approach to a market that has the potential for huge growth. They really have the opportunity to corner a market that has a huge potential for growth, especially in the developing world, where cryptocurrencies offer the possibility of replacing physical banks and allowing people to trade with the world from the comfort of their lounge and not needing to be anywhere near a physical bank location. 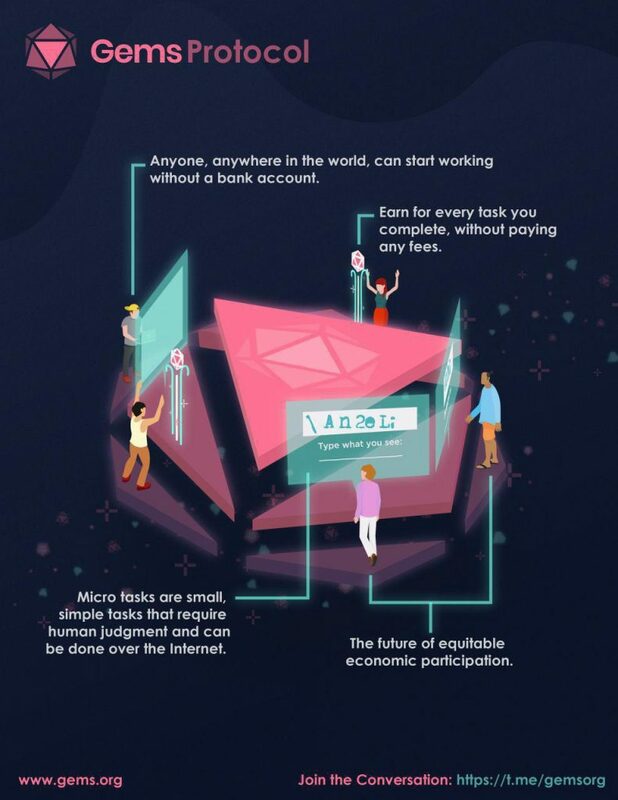 An Infograph by Gems Community Supporter. Users using GEMs does not have to worry about identification or linking there social media account to their work account. On the Gems Platform, users do not need to verify their identity to complete tasks. On platforms like Mtrurk, workers need to have a bank account to receive the check and leads to the problem like delay in delivery of payment. Using GEMs on the blockchain, miners are rewarded successfully. Blockchain reduces the transaction fees. The poor user interface which increases time and confusion is solved using their open source modules. The technology team comprises of Rory OReilly and Keiran OReilly , co-founder of gif.com. With advisors who founded Twitter, Augur(coin, ranked #46 by Market cap), reCAPTCHA, DNT(district0x) coin, Aragon, Stampery, and recipients of Forbes 30 Under 30.